I came around to Angela Merkel. Now she´s on her way out. Germany’s historically early exit from the World Cup this year wasn’t the summer’s only national tragedy. Almost immediately following the Nationalelf’s fateful matchup against South Korea, Germany plunged into political crisis: the country’s most vital and famously resilient foundations, it appeared, were crumbling all at once. I tried to ignore what I thought was sensationalist reporting. But as hard as I tried to shift my attention to something else, I couldn’t. 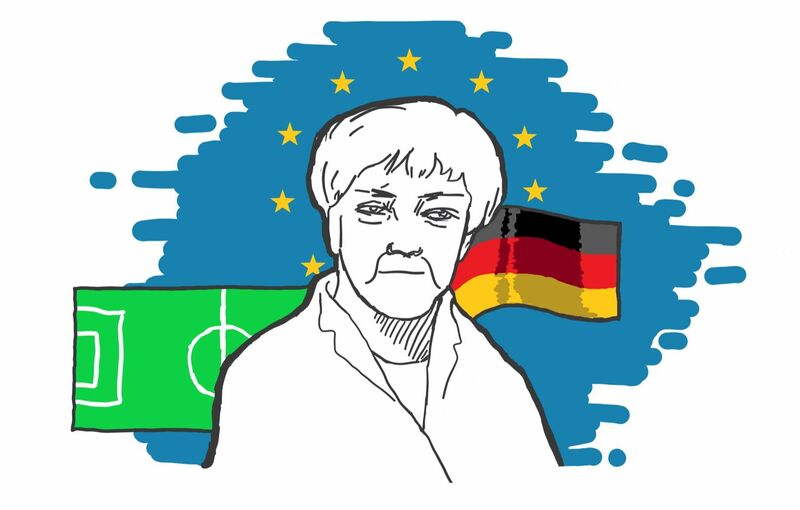 Everything I knew––in fact, the only Germany I’d really ever known––seemed to be on the verge of collapse, with two of the most important figures of my childhood—Merkel and Löw—poised to imminently bid the public eye adieu. Ultimately, both just barely managed to hold on. But the fibers had snapped. I was seven years old when Angela Merkel was first elected Chancellor in 2005. I distinctly remember the day because my parents had just gotten dial-up internet service and enthusiastically employed it to analyze possible government coalition configurations online. When I saw my mom, who worked for the center-left Social Democratic Party’s (SPD) political foundation, grimacing, I asked what was the matter. “Looks like we’re going to have a female Chancellor,” she remarked. “But,” she added, “she’s conservative.” After eight years, the days of the SPD-led Schröder government had ended, giving way to an East German woman and member of the center-right Christian Democratic Union (CDU) with a PhD in quantum chemistry. An impressive résumé, and, yes, a glass ceiling broken for women, but, as my parents bluntly put it, “She’s Opa’s candidate”—harkening back to my grandparents’ more conservative leanings to highlight that we’d have much preferred another term of SPD leadership. From then on, I regarded Angela Merkel as “Opa’s candidate.” Whatever she did, no matter how sympathetic she might appear, I’d remind myself that she was the conservative choice, not mine. Slowly, I—and my family—began to realize our party-based grudge had little basis. The CDU had been marred by a campaign finance scandal in the 1990s—creating great disillusionment with party and its administration. Amidst the ensuing culture of CDU skepticism, Merkel not only turned on her mentor—the storied Chancellor of reunification Helmut Kohl, who had been compromised by the allegations—but also vowed to fundamentally reform the party. In doing so, Merkel established herself as a unique persona unafraid to follow her own convictions in a system so often characterized by political conformity. It was subdued, but significant—and signaled to Germans that her party might bid its “boy’s club” reputation goodbye and finally play by the rules. Her East-German roots, too, promised to make German politics more inclusive, down-to-earth, and equitable. Merkel indisputably brought reform and stability to Germany, but her tenure has also had no shortage of missteps. Her vote against marriage equality in 2017 was particularly disappointing (though the measure ended up passing overwhelmingly in the Bundestag, the German parliament), and her refusal to phase out coal has proven enraging and hypocritical—especially given her labeling of Germany as a global climate leader. More recently, Merkel’s initial reluctance to fire now former spy-chief Hans-Georg Maaßen following his apparent sympathy with far-right rioters in Chemnitz proved disastrous and had some question her loyalties. On a European level, political analyst Martin Schmid laments Merkel’s “failure to use the window of opportunity” following Emmanuel Macron’s 2017 election to the French presidency to fundamentally reform the European Union in face of Brexit and rising populist tides across the continent. Whether she would have succeeded in this, however, is tough to say; despite being considered its de-facto leader, Merkel is resented by many within the EU for her handling of the Greek debt crisis and imposition of harsh austerity measures on struggling economies. Controversy is, to some extent, inevitable over the course of a 13-year tenure, and Merkel’s personal awkwardness and professional efficiency have nonetheless rendered her a potent and respected force across the entire German political spectrum. She governs with a sort of tough love and, until recently, has proven unwavering under pressure. Schmid characterizes Merkel's Chancellorship as one “marked by managing crises.” It should come as no surprise, then, that she has earned the title of “Mutti, ”or “mom,” in German society. Much like a mother, too, Merkel has become a constant in German life. Whether such tropes—and obvious gendering of her role—are meant to be demeaning or endearing, they are inextricably linked to her steady, reasoned nature. Regardless, Merkel’s presence has undoubtedly had a positive impact on young Germans’ perceptions of gender and its relation to power: she has been in office for so long that many (myself included) can hardly remember a Merkel-less Germany. In fact, it is not a rare phenomenon for German children today to ask their parents whether it’s even possible for a man to be Chancellor, amusingly innocent commentary for all who are aware of what German women had to endure to gain suffrage exactly a century ago, much less be represented in positions of political prominence. For a woman who has been unanimously considered the world’s most powerful over the past decade, Merkel has navigated sexism with considerable ease. She is so firm in her convictions and so steadfast and professional in her politics that sexist smears against her bounce back off of a resilient, bulletproof shield. Even her biggest rivals don’t dare attack her gender or appearance, and focus instead on her policies. Perhaps this is due to the fact that Merkel has consistently shied away from labeling herself a “feminist”; somewhat controversially, Merkel prefers to show, not tell. Internationally, she’s become “one of the boys,” respected as a vital asset and equal. Barack Obama famously characterized Merkel as his “closest” ally throughout his eight years as president, stating that he could not have asked for a “steadier or more reliable partner on the world stage.” Images of Merkel as the sole woman flanked by dozens of men at global conferences and forums have simultaneously empowered and enraged women: pride, on the one hand, for a woman stands at the helm; anger, on the other, that she is so alone. All the while, Merkel has quietly opened the door for women in the German political arena. Though Germany, like all countries, still suffers from gender inequality and underrepresentation, most major political parties are currently led by women: Merkel still (though precariously) sits at the head of the CDU; Andrea Nahles chairs the SPD; Annalena Baerbock leads the resurgent Bündnis ‘90/Die Grünen (The Greens); and Katja Kipping heads Die Linke. Even the far-right Alternative for Germany (AfD) is guided by parliamentary leader Alice Weidel, emphasizing that representation does not always mean equity and underscoring Merkel’s limits as a model. Now, following her announcement on October 29 to step down as leader of the CDU at the end of the calendar year following dismal performances by her party in the recent Bavarian and Hessian state elections, Germany is plagued by the uncertainty of what a future without Merkel will hold. She has been the head of government for 13 years, and the head of her faction for 18. As Schmid stresses, “she’s experienced three US presidents, four French presidents, and four British prime ministers during her time as Chancellor.” Given the longevity of Merkel’s tenure, her departure from the CDU’s helm promises to be a watershed moment in German political life. The beginning of the end for Merkel was the summer of 2015. As the borderless Schengen zone became increasingly militarized and xenophobic towards refugees fleeing violence, Merkel was a dissenting voice on the European stage, famously telling Germany “wir schaffen das”—“we can do this”—and taking in over 1.1 million refugees, predominantly from Syria and Iraq. The move no doubt ushered in massive demographic changes, was financially strenuous, and made Merkel no new friends politically (especially within her own party), but it was absolutely the right, and only humane, thing to do. A win-win, that is, until one considers all that has come since: backlash within Merkel’s own party, the rise of the far-right, increased culture wars, and xenophobic attacks. What in 2015 seemed to be a miraculous display of unflinching, mass German goodwill has quickly morphed into frustration, disappointment, and enormous polarization, as a result of a year that, regardless of where one lies on the political spectrum, indisputably changed the fundamental fabric of the country. Most left-leaning individuals of my partisan persuasion (who back the SPD or Bündnis ‘90/Die Grünen) feel 2015 changed society the better—officially characterizing Germany as a “nation of immigrants,” adding needed diversity, and fulfilling a moral imperative—while others, including most of the CDU, feel it changed for the worse—proliferating typical narratives of cultural erosion premised upon xenophobia. Political assertions have turned increasingly violent: 2016 saw 3,500 attacks against refugees, followed by 2,200 in 2017—absolutely startling numbers by any measure. The far-right defends its heightened aggression by harkening back to such events as the 2015/2016 New Years’ sexual assaults in Cologne—perpetrated predominantly by men of Middle Eastern and North African origin—and the terror attack on a Berlin Christmas Market a year later. These events are, of course, horrific, but using the behavior of lone wolves to justify militant (or latent) Islamophobia is enormously inappropriate. Sadly, the rise of the far-right AfD in 2013 has largely turned narratives of migrants’ cultural incompatibility in German society mainstream. When the right’s scapegoat is a massive group, Merkel becomes an easy individual and ideological target representative of “the problem”: the woman who not only allowed, but also encouraged all of this to happen. Many fixate on Merkel’s decision to accept over a million refugees as the trigger for her own political demise rather than recognizing this action as a humanitarian and moral necessity; Donald Trump, for example, enjoys claiming she has “ruined” Germany and the EU. With every political setback faced by the CDU, pundits shrug, claiming that Merkel “brought this upon herself”—somehow adopting the mindset that one individual’s political survival and retention of power is more valuable and important than the safety and security of millions fleeing persecution. Instead of placing the onus for Merkel’s declining popularity and the rise of the far right on her decision to be a rare moral leader in a time of crisis, I ask us to problematize the notion that a basic humanitarian action conducted by an extraordinarily wealthy country—the bare minimum, really—is considered a misstep by so many. Perhaps, then, we might regard Merkel’s departure from the CDU as a condemnation of where we (pitifully) stand morally as a society as opposed to censure of a uniquely principled leader. The necessity and inevitability of Merkel’s retreat reflects poorly on the German electorate, not her. Merkel claims she will remain in her post as Chancellor until the 2021 federal elections, but few believe she can retain the nation’s top job without secured party leadership and backing. If her coalition—already plagued by instability—were to break apart, new federal elections would be held and Merkel would no longer appear on the ballot. Even if Merkel defies the odds and manages to hold on to the Chancellery for the next three years, her abdication of the CDU’s leadership is to some extent a surrender; a signing of the death warrant of her own political career and its accompanying doctrine of moderation and accommodation within a traditionally conservative framework. Some view her retreat spitefully, as giving in to those further to the right in the CDU; others, like my mother, believe “she deserves respect for her decision,” especially following repeated poor showings by the CDU on the state level. She accepts that Germans seem to be looking for new leadership, though it is not at all clear who or what this new leadership might be. Some names have been thrown out—Annegret Kramp-Karrenbauer, Friedrich Merz, and Jens Spahn—but at this point everything is merely speculative. Filling Merkel’s shoes as chancellor is a daunting task: a political generation has come and gone since Germany last had to seriously ponder new leadership. Only one thing is certain: her successor as chancellor in 2021 will not be a moderate. Regional elections this year have shown a resurgence of the leftist Greens—and the far right. Which pole Germany decides to swing towards in three years is yet to be seen. In September of 2017, when Germany held its last federal elections—the first during which I was old enough to vote – many of my American friends asked me if I was “voting for Merkel.” After reminding them that Germany has a parliamentary system, where one votes for party rather than person, I clarified that the only way one could explicitly cast a ballot for Angela Merkel is if one resides within her congressional district of Rügen and Greifswald, in Pomerania (which I don’t), and that I wouldn’t dare vote for her party, the CDU, with whom I vehemently disagree on almost everything. And yet, if Germany were run under the largely persona-driven American presidential system, Angela Merkel would have almost certainly won my vote. Throughout her first three terms, Merkel showed an impeccable ability to work across partisan lines in strong coalition governments. Her tenure was characterized by cooperation, not confrontation. She has faced her fair share of challenges, but Angela Merkel has nonetheless achieved the delicate balance of becoming an individual force in a political system based upon conformity and the collective. She is unremarkably remarkable. And she will be missed. ALLISON MEAKEM B ’20 is tired of explaining that German conservatives such as Angela Merkel are still way more liberal than the likes of Nancy Pelosi and Chuck Schumer.